When the International e-sport federation (IeSF) successfully lobbied for the addition of esports to The Asian Games, it was lauded as a landmark moment for esports. We were finally going to be recognized by a traditional sporting organization as legitimate and stood a chance to earn our countries a few medals. But we didn’t realize, back then, how or what this would snowball into. Several months later, the Indian esports scene has been rocked by an incident which has resulted (for all the wrong reasons) in international attention towards our scene primarily caused by the leak of a scanned document – a contract which was called out as ‘predatory’ or even as the ‘The Worst Contract In Esports’. But that isn’t the crux of this article. The contract has opened up discussions about the Indian Qualifiers of the Asian Games which were conducted by the Esports Federation of India (ESFI). With several accusations raised against Mr. Lokesh Suji (the Director of ESFI) and his organization, we spoke to him about the org, the Asian Games Qualifiers, and the infamous contract. Based on the facts gathered after our conversations with him, the qualifier participants and other prominent Indian esports figures, there appear to be a few instances of conflict of interest, inefficient management of qualifiers and other allegations. Note: Since some of the players have spoken to us under the condition of anonymity, AFK Gaming has chosen to respect their concerns for privacy and have masked their identities. However, we have verified all the information published below by asking them for relevant proof. We first reached out to a player from the Indian League of Legends team, who wished to remain anonymous considering the circumstances, and spoke to him about the details of the League of Legends qualifiers. As per the player’s account, the only criteria required for selecting teams for the Asian Games 2018 - Qualifiers was that people needed to have passports. But because of the short notice, many players from India’s top teams were not able to obtain the said document in time for the event. A poll was conducted on the official ESFI page on May 26th to determine whether actual qualifiers were needed. The Indian League of Legends Qualifiers were then scheduled, publicized, and conducted in a 36-hour window. Hence the actual qualifier processes (including the poll) took place from May 26th to May 28th, even though the AESF announced the game titles on May 15th and set May 31st as the deadline to submit names for the South Asian qualifiers. The 13-day window between May 15th and May 26th could have been better used to secure passports. After the qualifiers, the aforementioned contract was presented to the players and we have been informed by the aforementioned player that the League of Legends team has refused to sign. Since the contract is only a requirement for the Asian Games, the team has since then travelled to Vietnam alongside Mr. Lokesh Suji and are currently representing the country in the League of Legends – South Asian Qualifiers for the Asian Games 2018. 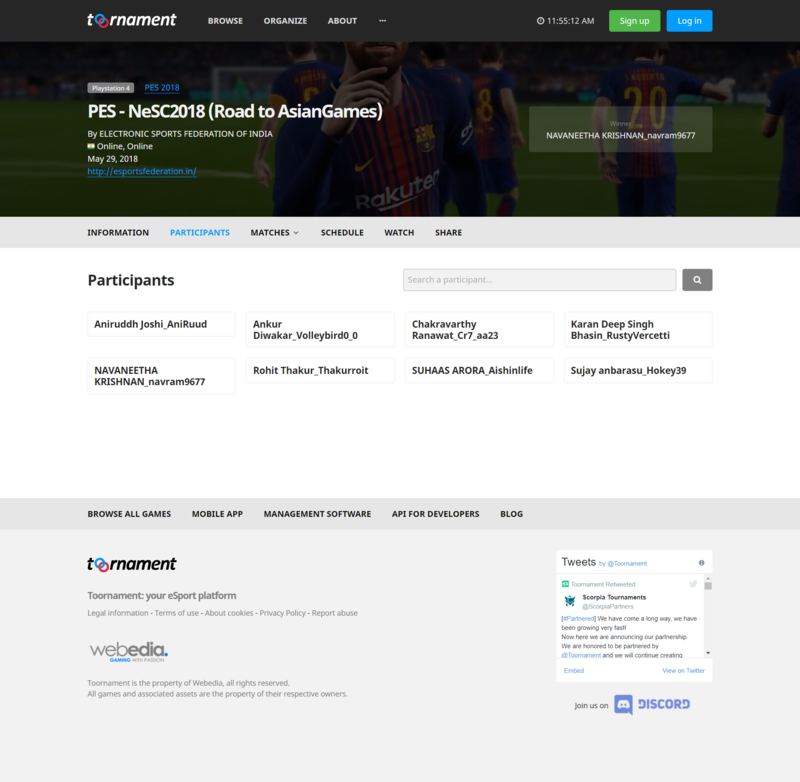 We also managed to get in touch with one of India’s qualified PES 2018 representatives for the Asian Games 2018 to get their perspective. The PES 2018 participants had just as bad of a time as the League of Legends players did. Their qualifiers were also scheduled, publicized, and conducted within a 36-hour window. Which lead to only 8 competitors registering for the event and playing in the online qualifiers on 29th May. For context, as per our estimates, the player base for PES 2018 across PC, PS4 and Xbox One in India is larger than 15,000. The reason for the abysmally low signups could be because the qualifiers were announced on 28th May giving aspiring players less than 24 hours to sign up for the event. After the aforementioned player secured a place in the Indian contingent, the infamous ESFI contract was presented to him. He agrees with the majority consensus which has criticized the contract for being predatory and vile. He also added that the contract has the potential to scare upcoming newcomers away from the Indian esports scene. The player has also alleged that ESFI asked the players to pay for 2 Tshirts each (₹650 each), for an online qualifier. Per our knowledge of the situation, the organization has since refunded the money which the players transferred. Mr. Lokesh Suji has presented us with sufficient proof to refute this allegation. The competitors were fully aware that the jerseys were optional, and chose to pay the organization of their own accord. ESFI has since refunded the money for the jerseys. However, since it is unfair to make judgments without hearing both sides of the story and so we decided to get in touch with Mr. Lokesh “dAwesomeNinja” Suji, Director - Esports Federation of India to get his side of the story. Incidentally, Mr. Lokesh Suji is also the Vice President of the Asian Esports Federation (AESF) which might be a potential cause for conflicts of interest. Q. In the 'Main Objectives' portion of the ESFI website, you have stated that "To be the official organization in complete and sole in charge of all esports matters in India and to guard and enforce rules in co-operation with the States esports Associations/Federations of the country and in full and complete collaboration with the Indian Olympic Association"
Would you say you have achieved that goal? Esports in India is still in very nascent stage but growing. People in India know about video games/video gaming but awareness of esports is still fractional. From sports perspective when you talk about games like badminton, cricket, kabaddi every one can easily relate but when you talk about esports, it comes as a surprise that competitive video gaming (esports) is now a sport. When you look at other sport federations, they have been in existence for many years (40-50 years or more), ESFI is pretty much a new federation and of a sport, whose awareness is minimum, more so, in India playing video games is not looked upon positively. Inclusion of esports in Asian games will definitely help and is helping in changing the perspective. It will take some time for ESFI also to fully achieve its objectives but we are moving very fast towards achieving them. ESFI is already in touch with various stake holders, it's just a matter of time. 2. We know that ESFI is part of the IESF which successfully lobbied for the inclusion of Esports in the Asian Games. Can we get some clarity on how ESFI became the official representative of India in the IESF? Asian Esports Federation also played a large role in inclusion of esports in Asian Games. Like any other International Sports Federations, International Esports Federation (IESF) also has its process of giving membership to the national esports federations, we applied through that process. 3. What do you think about the concerns raised by the Indian esports community, as well as reputed esports personalities across the world regarding the contracts issued for Indian esports athletes for the Asian Games? Do you think it's fair? Will there be any amendments made to the contract? If so, what amendments? The accusation that athletes are paying or have to pay for their own Air ticket/stay for Asian games is completely baseless. In beginning of the same document (which is being referred to in these accusations) Clause 7(Expenses), it very clearly states that "Expenses of Airtickets and stay for the Asian Games will be borne by the Asian Esports Federation (AESF)". These are similar kind of accusations which were levied on ESFI in year 2016, wherein ESFI was accused of scamming $ 200,000. These accusations were again baseless. There was a translation error (since IESF is a Korean organization) in one of the IESF press release which said "IeSF will be supporting each nation with 200,000 USD for athlete travel according to ……”, this amount actually was the overall budget, this error was corrected at IESF end and the correct version read as " IeSF will be supporting overall 200,000 USD for athlete travel according to ....."
Problem is that people don't try to verify the facts and go with the flow on various social media platforms and some people take advantage of this fact and make posts or blog with some catchy title to get more likes or upvotes. ESFI is very approachable organization and we are just a call away, there is no harm in reaching out and clarifying the facts for yourselves, the way you (AFK Gaming) is doing. We would again reiterate that We, at ESFI care deeply about the esports industry in India & have the sole intention of working towards the betterment and improvement of the sport and have been able to bring India to a level where we are talking about the Indian esports team for Asian games. As far as amendments are concerned, why not, ESFI stands for the Indian esports community and I, personally have spoken about this on many public forums. ESFI shall take into consideration the comments and inputs provided to us by players, teams, interested persons and stakeholders and after the requisite review process shall accordingly publish the amended and updated Regulations. 4. You organized, publicized and conducted the qualifiers for League of Legends, and PES all within 36 Hours. Do you think that was ample time for aspiring Indian competitors to sign up and make all preparations for the event? Esports has been included as a "demonstration" sport in Asian Games -2018, it's not a medal sports this time but will be in Asian Games-2022 at Hangzhou, China. The games titles were announced by AESF on 15th May 2018 & 31st May 2018 was the deadline to submit the names (along with the passports details). For Asian Games (esports), Asia is divided in five regions and India is part of the South Asia region. The winners of the Regional Finals (Offline/Online) will go for the main event at Jakarta and the schedule of Regional Finals is 10th June-20th 2018. The Indian Olympic Association (IOA) ultimately approves the sports which will be represented in Asian / Olympic Games. ESFI has been/is in touch with IOA on regular basis to get esports team approved, since it's a lengthy process and given the time frame available we decided to do the national qualifiers (subject to IOA approval) so that the moment they approve we have the teams ready. This deadline was extended till 5th June on 30th May, then we decided to do the qualifiers for AOV also. We were also advised to just select the team which we did not and basis the community poll (for League of Legends) it was amply clear that doing the national qualifiers is the best way to select the team. Not only us but all other federations including AESF had this challenge of time and if we all had more time for this prestigious event and a lot more could have been done. ESFI thanks the community and the volunteers, with their help, in given time span, we could do the qualifiers and now have qualified teams for League of Legends, PES, Clash Royale, HearthStone, and AOV, who will be playing in the regional finals starting 10th-20th June 2018. Our League of Legends team is already here in Vietnam for the South Asia-Regional Finals. 5. You have said that “International Esports Federation (IESF) also has its process of giving membership to the national esports federations, we applied through that process.” Can you clarify on how you became India’s national esports federation? Same way like any other organization is set up which has similar aims and objectives (promotion of literature, science or fine arts, sports etc). 6. You mentioned that the games were announced on 15th May, however the poll you’ve mentioned only went live on 26th May, and the qualifiers were announced on 27th May, and happened on 28th May. Why exactly was there a delay of 11 days? Considering that organizing, publicizing, and conducting the tournament clearly only took 3 days. This question has already been replied in point 4 of your previous set of queries. His statements indicate that ESFI hasn’t been approved by the IOA (Indian Olympic Association) and that the ESFI is conducting all these qualifiers pre-approval. For context, the IOA is the ultimate authority on choosing Indian competitors to represent the country in International sporting events such as the Asian Games, Commonwealth Games, and the Olympics. So how does ESFI get to choose players? The answer may lie in a situation which is a massive conflict of interest. The AESF has the authority to choose the National Esports Federation which conducts the qualifiers for the Asian Games. The AESF chose ESFI to conduct the qualifiers. Per Mr. Lokesh Suji's response, the Indian Olympic Association (IOA) has not recognized ESFI as the official body for Indian esports. This is not a pre requisite for conducting the South Asian qualifiers. You can find the contract that opened up discussions on the ESFI HERE and read about ESPN's take on the legal ramifications of said contract HERE.